The Renaissance– particularly the earlier Italian phase of the era– is a favorite area of study for enthusiasts of Western European history. But did it really happen? Or was what we call the Renaissance less of a singular event and more of a long evolution in elite cultural practices? Let’s see what you think. 1. Watch the Crash Course Video. After viewing the following video, answer the associated questions in your packet. Go to the Metropolitan Museum of Art’s interactive map of Western Europe between 1400 CE and 1600 CE. Use the map, associated timelines, and short articles to answer the questions listed on your packet. 3. Using JSTOR for Online Research. No matter what subject area you choose to study in college, knowing where to go for good, varied, and– above all– academic sources is a valuable skill. To that end, you’re going to learn how to use an online library called JSTOR— short for Journal Storage– and how to search appropriately for articles. As an online storage center for academic journals, JSTOR contains summaries, abstracts, book reviews, and full articles from thousands of different academic journals– everything from the New England Journal of Medicine to The American Statastician to Jerusalem Studies in Jewish Folklore. Because it contains so many sources, it is absolutely imperative that you learn to search effectively. Open a new browser tab. Go to the North Cobb Media Center website. Scroll down and click on the link on the bottom right which reads Cobb Digital Library. Select North Cobb High School on the drop down menu, and enter your student number in the user ID box. Ms. Galloway will have the password written on the board; copy it down onto your packet in case you need it in the future. Once you’re at the “View Groups” tab, click on the link which reads JSTOR. You will need to confirm that you wish to open the outside link. Doing so will bring up a student registration form. If you have never created a JSTOR account before, please fill out all required information (and yes, you are part of an institution– North Cobb High School) and hit submit. It wouldn’t be a bad idea to write down your user name and password somewhere you’ll be able to find it in the future. If you HAVE created a JSTOR account for another class, look for the grey box at the top of the page that provides a link to login if you have an existing account. If you can’t remember your password because it’s been a while since you logged in, have JSTOR send a “change password” request to your email and follow the directions. Now comes the tough part: you’re going to use JSTOR to find one particular article, read it, and then answer a few questions– and I’m not going to give you the authors names OR the article’s title. You’ll have to find it by searching correctly. Just a note: searching on JSTOR is not like using Google’s search algorithms. You have to be specific in order to find things, so we’re going to walk through this together. 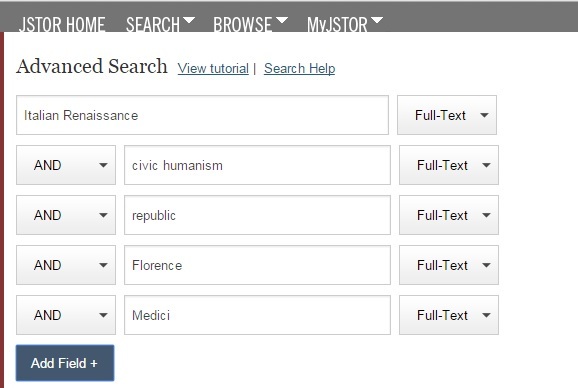 Once you’ve finished creating an account on JSTOR, click the Advanced Search button. Once you’ve filled in your search fields, scroll down: you’re going to limit your search by checking the boxes for “Include only content I can see,” and “Include links to external content.” You’ll also want to click the box for “Articles,” set the date range from 2000 to 2015, and select English as your language of choice. Scroll down a little further, and click on the box labeled “History”— this will make your search specific to journals that focus on history, rather than, say, food and drink. If you would like more information on how to search effectively on JSTOR, you can watch the following instructional video. Who knows, it might prove useful in your outside research for your final paper…. In the search box labeled “this exact word or phrase,” type Renaissance and Reformation. Every result will have these words in exactly that order. In the search box labeled “any of these words,” type Khan Academy. The results you receive can have either of those words. In the search box labeled “none of these words,” type Dark Ages. None of your results will contain this phrase. Limit your search results to English. In the search box labeled “site or domain,” type .org. This will make sure you receive results from non-profit domains. This does NOT mean that the material is immediately more reliable, but it’s certainly a start. Once you’ve got your terms defined, hit Advanced Search. Click on the first link generated by your search, and use it to answer the questions in your packet. You DEFINITELY want to check with Ms. Galloway to make sure it’s the correct site, however– Google’s search algorithms are constantly updating, so things can change in a matter of hours. 5. Respond in a Comment. When you have completed everything on this page, please proceed to Task Two: The Northern Renaissance.